Along my same drive to work, I spotted the L.A. Non-Consensual Conjugal Event Wagon again, and it looks bad. We don't want to go spreading gossip, but clearly that is blood from a Non-Consent. Okay, so it could be paint. And yes, there was a rather large extension ladder strapped to the top of this van, but shouldn’t we as a nation always be vigilant and overly-suspicious of potential Non-Consensual Conjugal Event Wagons? One day we don’t question the paint on a bumper, the next Ted Levine is asking us to help him load a couch into his van. 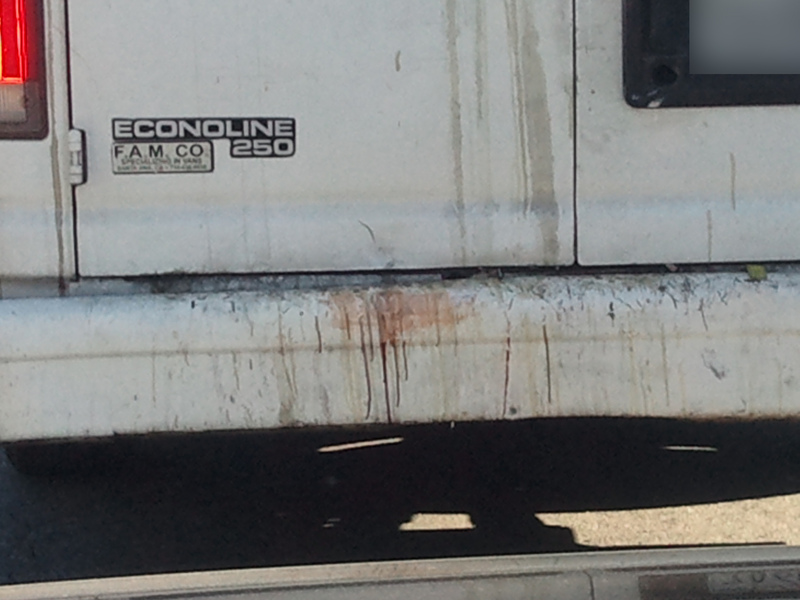 Posted on September 1, 2011, in America and tagged blood stains, creepy white van, silence of the lambs, Ted Levine. Bookmark the permalink. Leave a comment.